In Ohio, August is all about hot dusty days and unrelenting humidity. In Canada, this particular August has not displayed the kind of heat I am used to. The days have been sunny and clear, with a brisk wind that is a breath of autumn to come. We have been on Prince Edward Island (PEI) for the past week, in the national park, which is at ocean’s edge on the northern side of the island. One day was distinctly cold and blustery. We awoke wondering how it could be that a train was so close to the campground. It turned out that the train was actually the pounding of the surf. The island is divided into distinct cultural groups; French Arcadians, Mi’kmaq people and Scottish, English, and Irish. PEI wasn’t physically connected to New Brunswick until 1997 with the construction of the eight mile long Confederation Bridge. The island still has a distinct character separate from the rest of Canada. You can tell where you are on of the island by observing what flags people have raised on their properties. On our first day on the island, we were greeted by Patricia, the night supervisor at the park. She spoke with a distinct brogue, and as she rubbed Ryder’s belly she said “Ah, what a fine fella he is, now, aren’t you laddie?” I thought for a moment I was in a movie costarring Victor McLaughlin (old people into movies will know who I mean). We reconnected with Mary Clare and George, who are traveling with their little dog, Bandit. 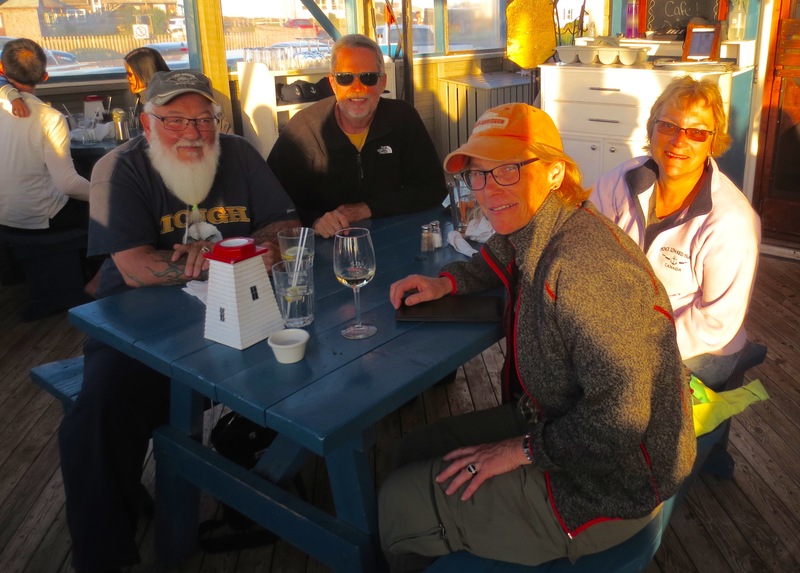 We met them in Fundy, where we found they shared our travel schedule. We have enjoyed having them to hang with here in PEI. This was their inaugural voyage. George is a Harley man through and through, but time has imposed limitations on him, so he has grudgingly reduced his time on two wheels and adapted to four. A determined man, the trailer and truck are his way of staying mobile. George is a woodworker and builds custom bikes. Mary Clare is a nurse and a cyclist, and a Harley rider in her own right. She rides a sharp looking Sportster. She and George are the type of people who show you pictures of their Harleys before pictures of kids or grandkids. Those of you who have been around Harley people know what I’m talking about. She competed in bicycle races until she was sidelined by West Nile Virus a couple years ago. It’s hard for me to contemplate that the robust woman before me was ever red shirted, but she has been recovering from the illness for a few years. Hearing about her experience has renewed my commitment to using insect repellent. George chafes at how Mary Clare fusses over him, but he allows as it’s better to keep moving forward rather than moping around feeling sorry for yourself. We have enjoyed their friendship immensely. One day we got in the car and crossed over to the eastern part (Francais, certainment!) of the island based on a brief entry in my guidebook. 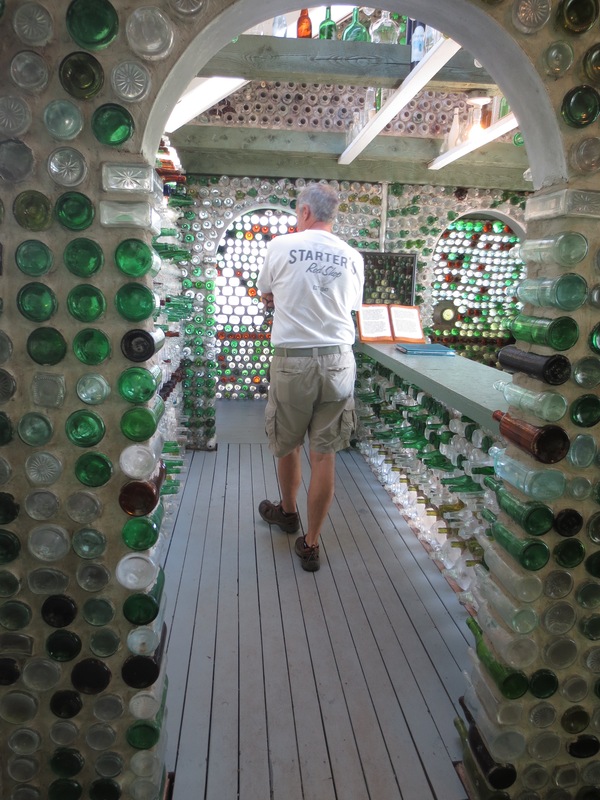 I wanted to visit the creation of Edouard Arsenault, the last lighthouse keeper at Cape Egmont, who retired and decided to build houses made out of old bottles. It was rather a long drive, and when we pulled up to the little gift shop, in front there was a big bottle built of–well, bottles. Ben, ever pragmatic blurted out “You mean we came all this way to see THIS?” But when we paid our entrance fee, we were both charmed by this man and his buildings. He was also a phenomenal gardener. His bottle houses are nestled among beautiful gardens he planted. I fell in love with them immediately. My pictures do not do them justice. The legend has it that he saw a postcard about such houses and was inspired to build his own. You’ll have to come to PEI to see for yourself. Ben in the largest bottle house.